Having in mind the XpressMusic branding, we thought that the music player of the Nokia 5800 will be one of the parts of the UI to see the most changes. As it turned out this couldn't have been further away from the truth - the application is quite identical to the S60 3rd edition versions. A few cosmetic changes here and there and touch-optimization is all that sets it apart. Not that the music player isn't capable enough or something - it surely has more than enough functionality. However some more eye-candy would be quite welcome. After all the touch interfaces are usually mostly about being fun to use and nice to look at. Your music library is automatically sorted by artist, album, genre and composer and searching tracks by gradual typing is available. You can also create your own playlists in no time. The process of adding tracks to the library is as simple as choosing the refresh option. You won't need to do that if you upload the music via the proprietary PC Suite application. With the huge number of supported formats you will hardly ever come across an audio file that the phone won't handle. Album art is also supported and if you don't like the default sound of the device you can enhance it by applying one of the five equalizer presets and if they seem insufficient you can create new ones in a matter of seconds. Quite naturally, the player can also be minimized to play in background. In this case a tab appears on the stand-by screen indicating the currently running track. Speaking of music playback, the 5800 XpressMusic turned out to be the best Nokia example for audio quality to date. That's that and no fancy foreword would've made sense. We've been seeing improvement over recent devices by the Finns and now the 5800 comes to crown the whole thing. In fact, we've never seen so good numbers on any other mobile phone. The phone flaunts an amazing frequency response keeping within the +-1db range effortlessly. Furthermore, for most of its range it is right on the perfect track. 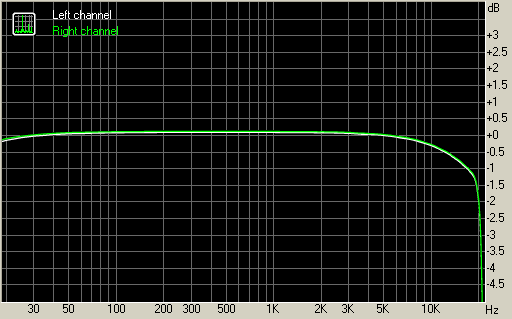 Noise level and dynamic range readings are also praiseworthy and so is THD. IMD and crosstalk are not as impressive but still quite good. All in all, you will be enjoying some of the industry best quality audio with Nokia 5800 XpressMusic. Watching a video on the Nokia 5800 XpressMusic is a mixed bag. The built-in video player has decent functionality but only supports a very limited number of codecs, no DivX and XviD. While this was hardly an issue with previous Symbian versions, developers haven't yet come up with a 3rd party solution for the 5th edition of the S60 UI. Some claim that their products are compatible but we couldn't get any of them to work properly on our unit. Anyway, this will most probably be addressed in the nearest future but until then you will have to resort to MP4 videos only. Luckily, the Nokia PC suite has a built-in application that automatically converts all kinds of video files to the format and resolution your phone supports - you'll need of course to upload through it. We would have preferred to use mass storage mode instead, but we'll have to do it the Apple way for now. In addition, the automatic converter seems to compress the videos too much even at the highest quality setting and they look over pixilated. The video player itself only works in fullscreen landscape mode but, since anything else would have made the widescreen display useless, this is understandable. When in fullscreen, a press on the screen shows the controls which are normally hidden. The amply sized high-res screen is also more than welcome for truly enjoying your videos. And if you have the video stand you might as well think twice before bringing your portable video player the next time you are going out. The FM radio on Nokia 5800 XpressMusic has a neat and simple interface and can automatically scan and save the available stations in your area. It also has RDS support and a first for Nokia phone - automatic scanning for an alternative frequency. This means that if you travel the 5800 XpressMusic will take care of auto-switching to the frequencies of your selected radio station. The RDS is the best part of Nokia 5800 XpressMusic FM radio. The radio station name gets displayed with cool effects across the whole screen, while the rest of the RDS readings are printed in nicely legible text on a line at the bottom. Now, we would have preferred this font a bit larger.